Despite claiming to defend Oregon’s public records laws, Governor Brown failed to report $165,000 in lobbying costs in “flagrant violations of Oregon’s lobbyist disclosure laws” – paid for by taxpayer dollars. Over the last few years, egregious scandals have rocked Oregon’s governor mansion. In 2015, John Kitzhaber resigned from office amidst a corruption scandal. Earlier this month, the Oregon Ethics Commission alleged that former Oregon First Lady Cynthia Hayes blatantly disregarded state ethics law, personally profiting from her public position. The total fine could be as high as $110,000. Since Kate Brown assumed the governorship, she has played the “ethics” reform card for political advantage. “I am the one responsible for ensuring a public records policy,” the governor told a reporter in late 2016. Our auditors at OpenTheBooks.com fact-checked Brown’s promises of transparency, accountability, and a new day in Salem. We found what appears to be flagrant violations of Oregon’s lobbyist disclosure laws. This is the set of laws that national democrats are using to try and hold President Donald Trump’s administration accountable. Since 2016, Brown has designated 52 “Office of Governor” employees as “lobbyists” working on the “governor’s agenda.” However, Brown’s official “Lobbyist Expenditure Report” displayed on the Oregon Ethics Commission website showed zero dollars spent on lobbying for the past seven quarters (website screenshot from 1/23/2018 here). Obviously, it’s impossible that the governor’s office spent zero dollars. It wasn’t until our team at OpenTheBooks.com asked for confirmation that Brown’soffice churned out records showing $165,489 in lobbying costs! Now, the governor’s open records lawyer is “on the record,” confirming these new records as official and accurate (click here for emails). But, our analysis shows they are still wrong – grossly inaccurate and fraught with reporting problems (review the new records here). The governor’s math doesn’t add up. For example, in the second quarter of 2016, Brown reported just $11,885 in total lobbyist compensation costs. However, after adding up compensation to Brown’s 30 lobbyists, the total actually sums to $24,510. These new documents from Brown’s office still showZERO dollars spent on “reimbursements” or any other overhead for lobbying. She’s expecting you to believe that her 52 lobbyists never ate a meal, drove their car, used their cell phone, sent an email, or made even a single expenditure outside of the pro rata calculation of salary expense. Of course, this is impossible too. 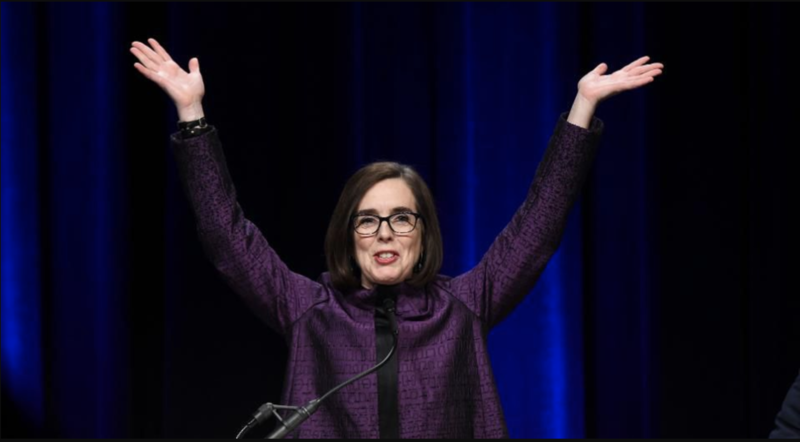 Furthermore, the new documents show $10,201 paid to Governor Kate Brown in lobbying compensation, even though the Oregon lobbyist registration law specifically exempts the governor from registering or reporting as a lobbyist! The governor hired former state representative Peter Buckley part-time for $60,000 to lobby her legislation despite a 2007 law that requires former lawmakers to take a session-long cooling-off period between leaving office and assuming lobbyist work. Brown argued her office – as a public agency – was exempt from that law. The governor’s new filing only shows $113 in lobbyist compensation to Buckley. Brown’s staffers Chris Pair and Bryan Hockadayallegedly violated state ethics laws by filing late lobbyist disclosure reports. The Oregon Ethics Commission issued “letters of education” while reprimanding both. The governor even politicized her “good government” open records attorney, Emily Matasar. In 2017, a press release announced Matasar’s newly expanded lobbyist role, and newspapers have covered her advocacy activity. Still, the ethics website shows zero dollars spentwhile new disclosures show $1,106 for Matasar. Recently, the governor’s office decided that our open records request for the calendar of Ivo Trummer – the governor’s legislative director and, therefore, her chief lobbyist – “does not primarily benefit the general public.” The governor wants to charge us hundreds of dollars for an electronic copy. Incredibly, the open records attorney issuing the opinion protecting Trummer was Matasar –one of the governor’s lobbyists! Brown’s official lobbyist reports are in stark contrast to the disclosure filings of all other state constitutional officers. The Secretary of State, Treasurer, Bureau of Labor and Industry, and even the Attorney General’s Sexual Assault Task Force file their reports and disclose hundreds of thousands of taxpayer dollars spent on lobbying. Brown’s staff argues that they filed their ethics reports on time by uploading disclosure information showing $165,884 in lobbyist compensation to the backend of the Oregon Ethics Commission website. However, on the public-facing portion of the website, the governor’s office entered $0 for each of the last seven quarters via their electronic filing. We confirmed this with the ethics commission (view the screenshots here). We reached out to each of the governors staffers mentioned in our editorial, and none of them responded to comment. State law requires both lobbyists and their employers to file reports. Each of the governor’s staffers who are registered lobbyists are still reporting ZERO dollars spent on lobbying on their individual reports. Governor Brown is the only constitutional officer in Oregon with a big ZERO spent on lobbying for the last seven quarters on the Oregon Ethic Commission website. Though she eventually produced the records to us showing $165,489 in lobbyist expenditures, after six days, the official website still shows zero dollars spent by the Office of Governor.